Consistently ranked among the top computer science and engineering graduate programs in the nation, the Paul G. Allen School offers our 250 full-time graduate students a collegial and supportive learning environment; research opportunities of the highest quality; and the chance to collaborate with entrepreneurial faculty who are recognized leaders in their fields. We are proud of our record of accomplishment in mentoring student researchers who go on to positions at the very best academic departments and industry laboratories. Working together, our students and faculty drive our field forward while generating innovations with real-world impact. Comprehensive, high-quality graduate computer science curriculum. A vibrant academic and social community. Welcoming and inclusive environment for international students, women, and other underrepresented groups. Robust schedule of colloquia and lectures on current topics in research and technology. Leading-edge interdisciplinary research opportunities, on and off campus. Our students benefit from many collaborations and relationships that we have developed across the campus and in the region. 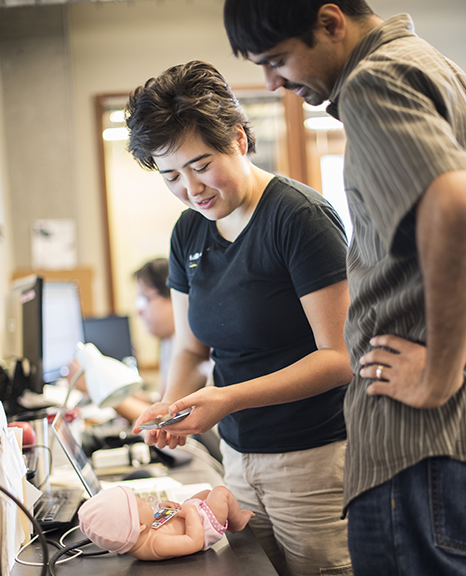 In addition to being the headquarters of established technology leaders such as Microsoft and Amazon, Seattle is also home to an extensive (and ever-growing) list of engineering centers established by major industry players from outside the Pacific Northwest. Admission to the Allen School’s Ph.D. program is competitive. Each year, we receive applications from approximately 1,600 prospective graduate students from around the globe for 45-50 positions. We accept applications once a year, for entrance in the following autumn quarter. Our application process opens on September 1, and all application materials are due December 15, or the next following business day, if the 15th falls on a weekend. The Allen School hosts its annual Grad Visit Days in March for applicants who have received an offer of admission. This event provides an opportunity for applicants to meet with faculty, get to know their prospective colleagues, and experience the Seattle area’s quality of life. The Allen School's Ph.D. process consists of three components: coursework, research, and thesis preparation. At the beginning of the program, students will take graduate-level courses in an array of topics spanning theory, systems, programming, and applications. They will also develop and refine their research skills working with their faculty advisor and other collaborators. These skills include information analysis and synthesis as well as written and verbal presentation capabilities. Student progress is measured at multiple steps throughout the program: the Qualifying Evaluation (a.k.a. “quals”), the General Exam, and the Candidacy of Philosophy, leading to the preparation and defense of their dissertation to obtain their Doctor of Philosophy degree. Students are required to complete approximately 90 credits on their way to obtaining a Ph.D. degree in Computer Science & Engineering from the Allen School, 60 of which must be earned at the University of Washington. Explore our online course guide to peruse available courses, teaching schedules, internship credit, and specialized degree tracks available to Ph.D. students. Visit our online student handbook for essential information and advice about being a Ph.D. student in the Allen School, from available fellowships and travel grants, to navigating the annual review of progress, to mentoring undergraduate researchers. This section also contains practical information such as allocation of office space and obtaining health insurance, as well as the forms students will need to complete at various points throughout the program. The Allen School's graduate advising team is here to guide prospective and current students as they navigate the application and registration process and help tailor the Allen School experience to their education and career goals.